Raising tomatoes is a wonderfully frustrating hobby. If you expect perfection, it’s not for you. But the payoff is incredibly enticing: To me, there is no greater difference in the food chain between the taste of a home-grown tomato and the mass-produced red orbs you get at the grocery store. We grow ours without commercial fertilizer. We make our own fertilizer and soil, and depend on household waste, the bathroom habits of relentless worms, the benevolence of the U.S. Park Police, and eggshells. If you have a space that welcomes the summer sun for two-thirds of the day, you can do it, too. 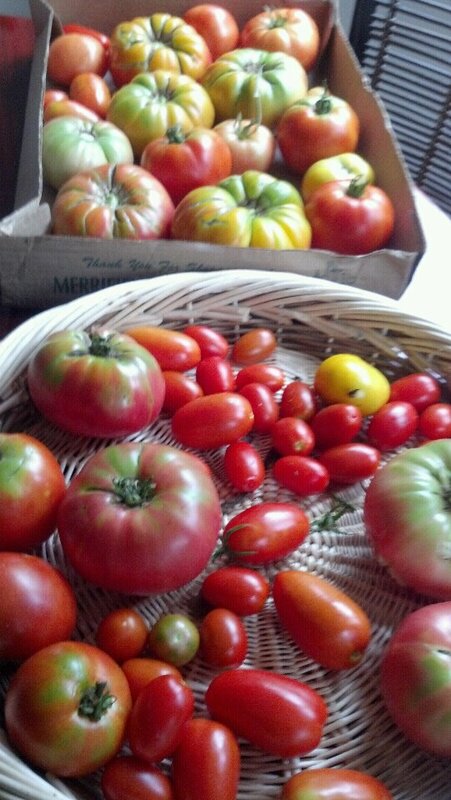 We have a garden, so we are able to experiment with heirlooms, hybrids, and tomatoes of all shapes and sizes. If you are single or have space for just a plant or two, I’d highly suggest a reliable producer of large tomatoes. We found German Johnson, Old German and Brandywine to be especially productive heirlooms in our Northern Virginia climate, and Big Boy and Early Girl to be reliable hybrids. Start with the soil. We go with a 1-1-8 mixture of horse manure, compost and good garden soil – one part manure, one compost, eight good soil. In the D.C. area, the U.S. Park Police just off Rock Creek Park near the zoo offer free horse manure; we haul it in our SUV in pails. DO NOT OVERDO the manure. Too much nitrogen can be like crack to a growing tomato, producing a leggy plant that grows impressive vines but forgets about the fruit. We compost our yard waste and household waste and so we have a constant supply. Anyone with a mowable lawn really has no excuse for not having an active compost pile that will save you dollars and provide a natural soil booster that you simply can’t get in a bag. And you will be aiding the environment. We produce two not-so-secret ingredients that boost our tomatoes. One is Worm Tea, and I swear you can almost see the tomato plants reaching for the bottle when we approach to apply it. Worm Tea, for you uninitiated, is the liquid byproduct of a worm bin. You can make one for $10. Buy two plastic bins. Drill two dozen holes half the size of pencils in the bottom of each bin, and smaller, small-nail-sized holes in ONE of the lids. Keep the other intact. Put 4 inches of dirt in the bottom of one of the bins, then dig for about 250 worms and add them. Apply finely shredded newspapers about an inch deep atop the dirt, and then start adding household waste – beet and carrot tops, carrot peelings, etc. Avoid acidic things like citrus; they tend to give the worms stomachaches. NO DAIRY PRODUCTS. Keep watch and be careful not to make the mixture too wet; you do not want to drown your worms. Add more dirt if it seems too moist, and be careful not to overload them with waste the first few weeks. Place the bin over the intact top. This will serve as the catch-basin for the “tea.” You will need something to elevate it an inch or two above the catch basin. I have found old pallets that are often thrown away by outdoors stores to work quite well; sit the bin atop the pallet and slide the catch cover below it. Cover the basin with the lid with the holes in it. In time, depending on your worms’ appetites and their ability to reproduce, you will start getting liquid in the catch basin. We funnel it into old bottles. Mixed with four parts water, it is simply the best thing you can put on tomatoes when you plant, and when they are first flowering. Our bin annually produces about a half gallon of “tea,” which we could probably sell as liquid gold on the Internet. It is more than enough for the 10-12 tomatoes we annually grow. We often give it as gifts to friends. The second “secret” ingredient is eggshells. We begin keeping them in grocery store bags in January. Dry ‘em and crush ‘em in the bag. Upon planting, add the equivalent of 1-2 shells around smaller tomatoes, i.e. cherries or grapes, and 3-4 for the big, meatier plants. Simply put them around the roots before you cover at planting. You do not need a lot of space to raise great tomatoes. Even if you live in an apartment, if you have a balcony with sun exposure, try a potted plant for a season; make sure to err on the side of bigger pots to give your plant plenty of room to spread its roots. Crop rotation is very important. We never plant tomatoes in the same place two years in a row. Tomatoes demand a lot of their soil host and tend to leave diseases behind, and if you are using containers, start with fresh soil mix each year. Do not get discouraged if the plant does not always look healthy. Tomatoes, like people, can have the blues (or yellows, one sign of overwatering). Don’t expect perfection. You will grow some of the ugliest tomatoes you will ever see; but beauty won’t be in the eyes of the beholder, but in the taste buds. I didn’t know about the eggshells. Thanks for that idea. What is your soil like? I have Sahara Desert-like sand, so I do add plenty of homemade compost. Nematodes are my worst enemy. I try to buy VFN tomatoes to help with disease and infestation. We grow A LOT of tomatoes here in California….so I have to get pretty sneaky about giving them away. Calcium in the eggshells grow sturdier stems/branches. Our soil is marine clay, hard as a brick, so we pretty much have to build the soil ourselves. Abundance is a blessing — our friends stay close! Great idea about the egg shells! We will give it a try next summer.